During my junior year at Duke, I took a Statistics course that was a requirement as part of my Public Policy degree. I bombed it horribly. Numbers were just never my bag. But I do know enough about probability to expect that our luck with housing on the road with The Lion King was going to drop off sometime! And that time would be now, in St. Louis. We seemed to sit pretty with great places I found in Richmond, New Orleans and Greenville. Even Orlando, Miami and Houston, despite some initial glitches, ended up serving us just fine. Then we get to Missouri. 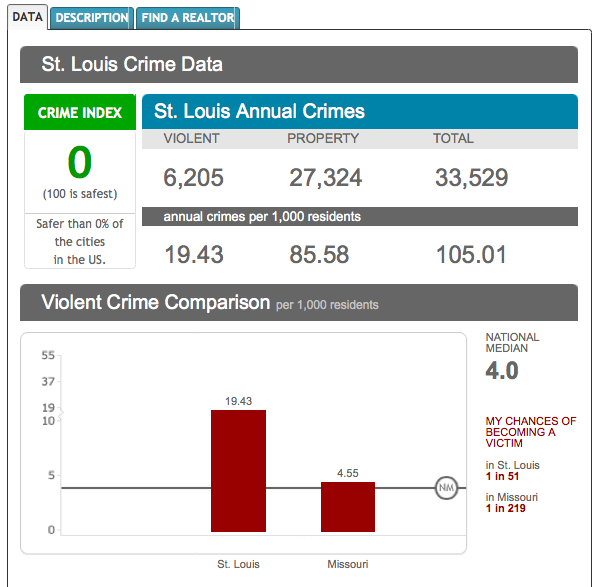 People, it says that St. Louis is safer than ZERO PERCENT of all cities in the COUNTRY! Whaaaat??? Also, my chances of becoming a victim is 1 in 51? Even DETROIT is ABOVE St. Louis, at a crime index of 1! I am generally not a worrier. But now that I have Max to think about … this was worrisome. So, I did some research and booked us an apartment on Airbnb.com in what I heard was the safest and most walkable neighborhood in the city, close to the theater: the Central West End. We’re good here, right? Max and I were visiting my in-laws in Pennsylvania for a week before we arrived in St. Louis to join Mike. Two days before we got there, there was a shooting and a few armed robberies — one block from where we were staying. In the charming part of the city. It’s one thing to have this happen in New York City; there is usually a bustle of activity and pliant expectation of decorum that keeps you feeling sort of safe. 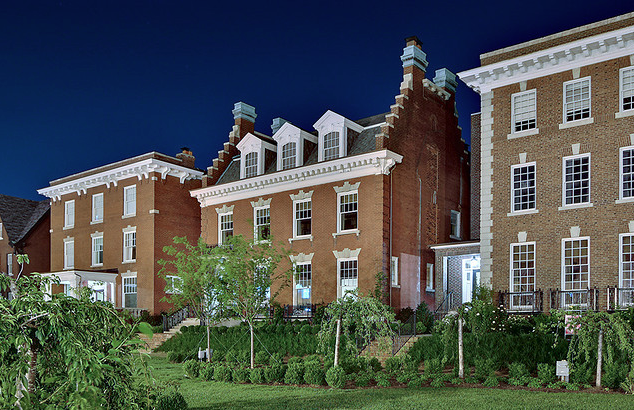 But here in the Central West End, there are stately rowhouses and sprawling mansions within blocks of where we live. Even with this backdrop, you look down the street and wonder if something could possibly happen to you. It’s eerie and disconcerting. I was walking last night on Maryland Avenue, down to Euclid Street to get some frozen yogurt with Max and my friend Shanda, and a somewhat green local news reporter accosted me for a sound bite on the safety of the neighborhood and my reaction to the shootings. I was in what I call Lo-Fi Mommy Mode (unwashed hair, grubby sweats, general exhaustion) but I agreed to do it because I know what it’s like to be in his shoes. I sort of assumed that it would never make it to air, since I gave meandering, lackadaisical answers. But remember that saying about the word assume? Please don’t ask me why I’m smiling. I’m talking about crime and police presence — and I’m smiling. Go figure. We have one more week here before we move on to Wichita, and we’re trying to stay positive. 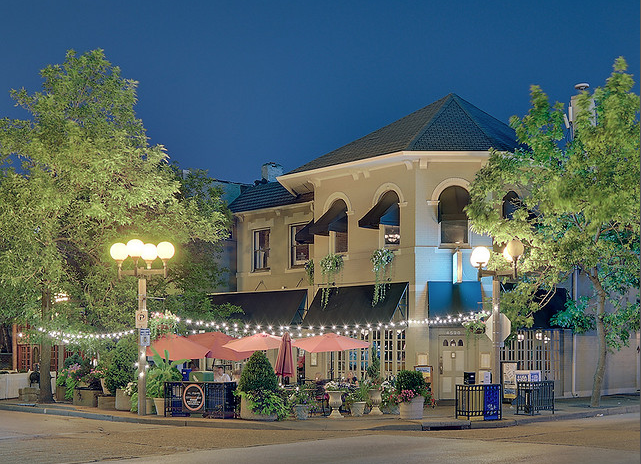 It really is a charming neighborhood, filled with restaurants, boutiques, elegant hotels and bars. It would be a shame to not walk around and enjoy it. Do I let this weird violent juju dictate my daily life here? Do you think I’m overreacting? hello hollicks, you shouldn’t let these crimes keep you from enjoying st. louis (or wherever you are), just use common sense when walking down empty dark alleys etc in any city and you’ll be just fine. Very true, Steve… we practice pretty good common sense but it’s hard when we’re in a new city every month. 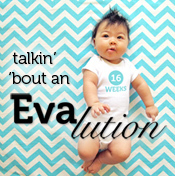 We want to trust our judgement and perhaps that’s all we can do! I don’t think you’re exagerrating, Angela. St. Louis is a dangerous place – my cousin went to Wash U and his car got broken into 3 times last winter. Definitely stay vigilant. Good luck! Sorry to hear about your cousin, Robyn. We had our GPS stolen out of our car in the suburbs of Orlando, right in our driveway — so it just goes to show that these things can happen in the middle of a city or out in a “safer” area. Thanks for your concern! Get the heck outta Dodge, Hollicks! Come back to Buffalo!! Do the show year round here! Thanks for the invite, LKF!! Can we stay at your house? I don’t blame you for being unnerved by a shooting so close. 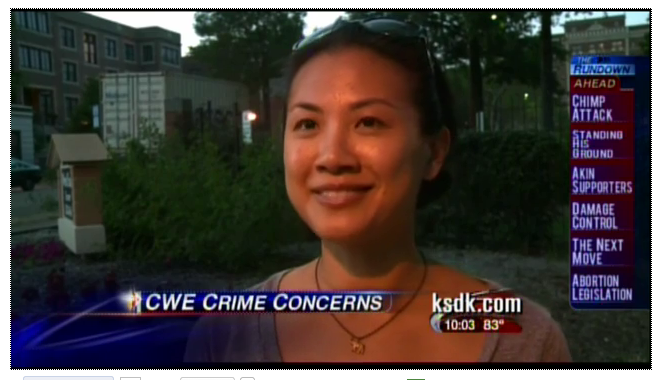 I’m sure the professionals (and millionaires) who live in the CWE feel the same way. That was very unusual for that area. 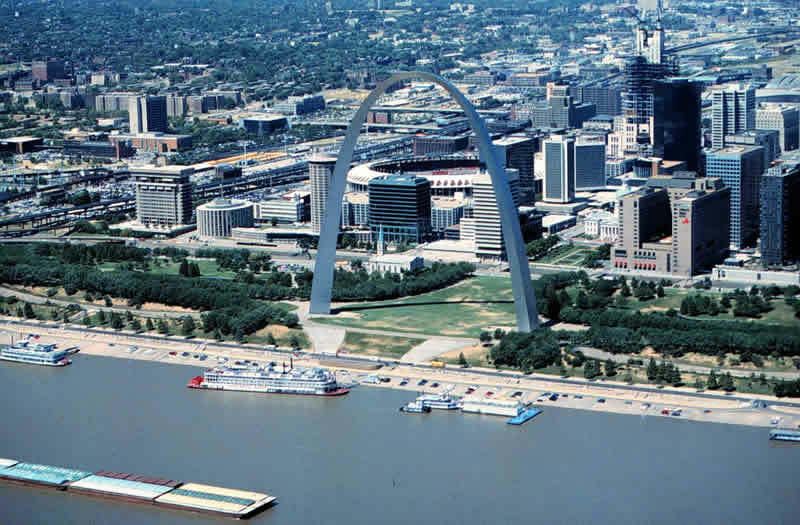 If it makes you feel better, the reason St. Louis ranks so high on the dangerous lists is because the statistics don’t consider the surrounding (affluent/safer) suburbs like other cities’ statistics do. It’s true there are some consistently unsafe parts of the city; you’re not staying in one of them. I hope you find some redeeming qualities over the next week. I’m looking forward to seeing the show on Tuesday! Wow, what a fantastic production! Mike- I was so, so excited to hear your name announced as Scar, and I was blown away by your performance. Previous post: We ride, again!